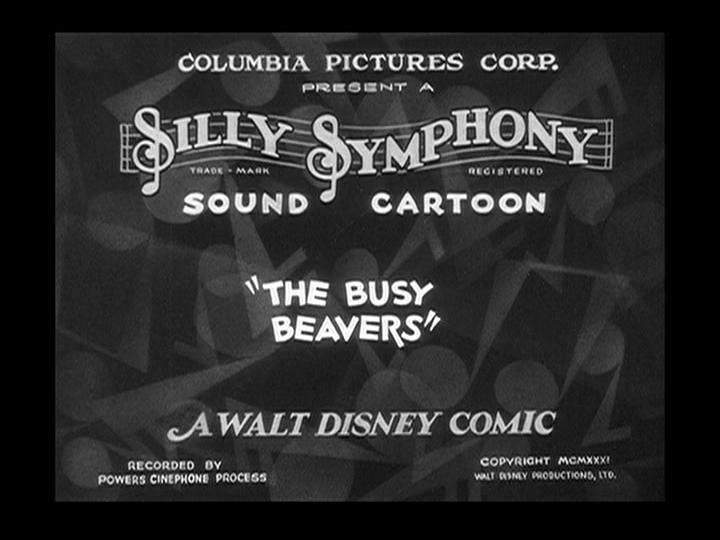 On June 30, 1931, the Silly Symphony The Busy Beavers was released to theaters. It was directed by Wilfred Jackson. A group of beavers are diligently working together to build their dam, dancing while they work. As one gathers twigs, he accidentally disturbs a moose, thinking the antlers are twigs to use. Others mix up mud for use, while others use whatever they have on hand to create this dam. Two beavers go around chopping down trees marked for use, and when a pair of caterpillars find that their home has been marked, they quickly remove the “X,” leaving their home unscathed. A storm quickly approaches, and the beavers scramble for cover in their dam. One little beaver, on his way home, finds a leak in the dam. He goes to plug the leak, when another one appears, followed by more. He is unable to cover them all with his own hands, and starts crying out for more help. A raincloud appears over the dam and dumps its contents into the mountains, with the water taking out everything in its path, including the recent work done by the beavers. As the animals try to scramble to safety, the young beaver quickly cuts down a large tree to stop the flow of the water. He achieves the feat, but is seemingly killed in the process. However, he appears from the top of the tree, unscathed, and is regarded as a hero for saving the day. Posted in Uncategorized and tagged 1930s, Black and white, Short film, Silly Symphony. Bookmark the permalink.